The Ukrainian pilot, who for 26 days now is on hunger strike in a Moscow SIZO–6 [detention center #6], described to Zoya Svetlova how she spent New Year’s and Christmas, her unanswered requests to investigators and how she has not received any letters for over two months now. A freshly-painted green four-person cell in a special block of a women’s detention centre in Pechatniki District. In the cell there is 24-hour video surveillance. 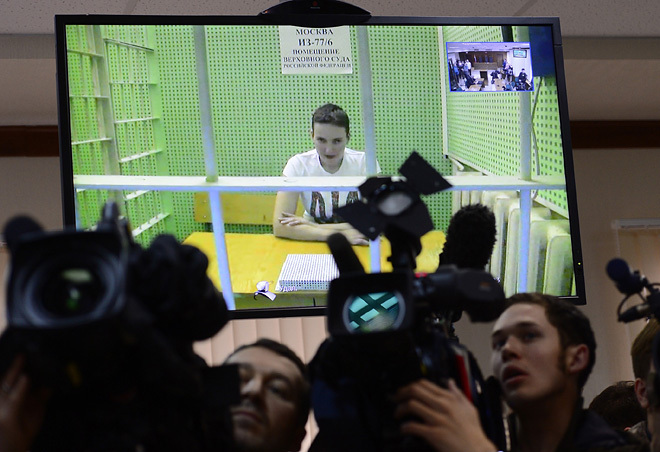 Here for over three months Nadiya Savchenko sits in solitary confinement. She is on the 26th day of her hunger strike; she drinks only tea and water. A few days ago the doctors put her on a drip with glucose. – OK. Every day a doctor comes to me, weighs me, takes my blood for sugar levels, measures blood pressure. Today it was 110 by 70. Usually I have the same blood pressure. During the hunger strike I have lost 10 kg [approx. 22.5lbs]. Now I am drinking tea – the water has acquired a strange taste. – Why have you declared a hunger strike and how long are you planning to keep going? – I am on hunger strike to get some common sense out of the Russian government and conscience out of the Investigative Committee. I feel sorry that you have such judges who make such decisions: in the presence of evidence of my innocence, they leave me in custody. – When I was talking to the Ukrainian director Oleh Sentsov in Lefortovo prison, he gave you his greetings and said that he does not understand why you are starving yourself. He does not believe that a hunger strike can achieve anything. – Pass on to Sentsov that it is better to do at least something than not to do anything. – I wrote to the head of the detention facility, to the Prosecutor General, to the Investigative Committee: if they force feed me, I will consider the force feeding to be torture. – You underwent a psychiatric examination in the Serbsky Institute. What were the results of the examination? – The examination showed that I am mentally healthy. I was surprised that the psychiatrists, during the examination, used an interview of a priest who accuses me of wanting to sell the organs of prisoners. I first saw this priest on television. How can a man of God lie like that? If they take such witness testimonies into account, then a person can be kept in custody their whole life. – Why are they not transferring you back to the Voronezh cell? Is there some investigative work being carried out with you here, in Moscow? – For the duration of the investigation I will be in Moscow, after all the case is being run by the Investigative Committee of Russia, and it is more convenient for them if I am here. First they wanted to hide me in Voronezh, but nothing came of that. Now they are conducting examinations: an examination of my clothing, they want to find traces of mortar on it. In vain: they won’t find any traces on it. Another examination: they found some maps of the local area with some notes. Wanted to take samples of my handwriting, trying to prove that these were my notes. Let them show me these maps, then, maybe, I will show them samples of my handwriting. – How did you spend the New Year and Christmas? – I cut out snowflakes and hung them on the walls. Made a Christmas tree out of cardboard (from the toilet paper roll – OR). I’ve only removed it today. [I] Drew some pictures for the New Year: a tree, a snowman and a sheep. For Christmas – a landscape: a house, people walking around and angels in the sky. Remember how Gogol described yuletide in “Evenings On a Farm Near Dikanka”? On television, some fragments of information. Today I found out about the terrible events in Paris. The people who did this have no sense of humour. – Do you receive letters from home? – I have not received any letters for two months now (RosUznik, a volunteer initiative designed to offer assistance to detainess, told the members of ONK [Public Oversight Commission] Moscow that several letters have been sent to Nadezhda Savchenko to detention center #6, and from the detention center at the end of December there was an answer that the letters were given to her – OR). 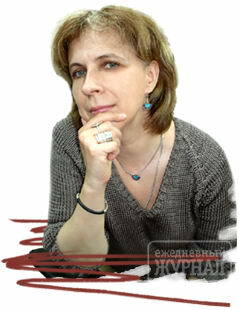 Before the New Year I sent several e-mails to Russian people I don’t know who wrote to me. I don’t know whether they received my e-mails. The main thing that worries me: the investigator does not let me call my sister Vera. She is forbidden entry into Russia. On January 12 it is her birthday. I would want to call her and congratulate her: with the New Year, and Christmas, and her birthday. I have seen my mum for 20 minutes in the Serbsky Institute. But my sister – no. I have written many times already to the Investigative Committee, asking that they let me call my sister. There is no answer. This entry was posted in #Free Savchenko, English, English News, Eyewitness stories, Pictures, War in Donbas and tagged #FreeSavchenko, #Nadiya Savchenko, #RussiaInvadedUkraine, #StopRussianAggression, #UkraineUnderAttack, Ukraine, Zoya Svetova. Bookmark the permalink. The Kremlin still refuses to release N. Savchenko from the ILLEGAL detention. She has been continuing her hunger strike for more than A MONTH. For decent people around the world, starvation for ONE MONTH in a prison cell means something very serious but, for the Kremlin, it apparently doesn’t. The condition of the illegal detention of N. Savchenko is NOT DIFFERENT in essence. Let more people around the world know that she is still being forced to starve herself in the Kremlin’s prison. The Kremlin should free her and immediately without condition. Putin will stop when he places Nuclear Missises placed for America’s destruction back on Ukrainian soil as it was prior to the 1994 Budapest Memorandum , you will wake up when the missiles are pointed at your faces. Enjoy your good nights sleep now because it will not last long. Russia Is FUNNY they have a prisoner of war, when they swear they are not making or in a war! Nadezhda Savchenko the female Ukrainian pilot not only are you one of Ukraine’s Hero’s you’re also an inspiration for all woman, ladies and girls! Your tougher than Putin and you will always be in my heart. I will pray for you Nadezhda Savchenko. G0D Bless you! May Mary, Jesus, all the saints, the angels of G0D comfort you and keep you in your Ways! 1994 Budapest Memorandum is why the Ukrainians did not build up their forces. Ukraine had the Worlds 3rd Largest Nuclear Arsenal only twenty years ago. America, Britain, China and Russia said they would defend Ukraine with boots on the ground if they were attacked in exchange that Ukraine would let the arsenal be dismantled. Like the brave souls on the 911 plane that was heading toward the Pentagon, they intercepted the terrorist mission by rushing them. ALL OF THE NATIONS OF THE WEST SHOULD STAND UP AND RUSH RUSSIA OUT OF UKRAINE! TELL PUTIN WERE NOT PUTTING UP WITH HIS THIEVING LAND AND UTILITIES GRABBING and bulling. OBAMA is doing a great job damning the future of this country, by not booting Russia out of Crimea.